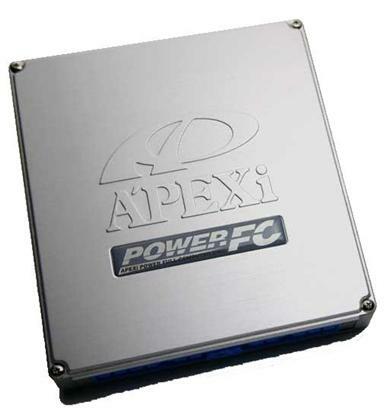 The Power FC proudly stands as A’PEXi’s answer to the constraints and limitations associated with most piggy-back style fuel controllers. The Power FC is a complete, stand alone, total engine management system capable of handling virtually anything thrown in its path. From multiple point fuel and ignition control to VTEC engagement (Honda applications) and boost settings, the Power FC is capable of accommodating even the most demanding performance enthusiasts. Currently available exclusively through Power Excel Shops the Power FC replaces the factory ECU and controls all vital engine parameters (Off road use only, no OBD-II). Installation is as easy as replacing the factory ECU. (Some minor rewiring is required on select vehicles). The factory engine harness does not need to be replaced and all critical accessories such as air conditioning continue to function. By using the optional FC COMMANDER, the user can adjust and modify a wide range of settings. Since there is no need to upgrade ROM chips or modify ECU’s, the factory ECU can be kept by the original user. The Power FC operates off of three Main Menus. These menus are: Monitor, Setting, and ETC. In addition, there are 4 display patterns allowing 1-8 parameters to be shown on screen simultaneously. The data displays in numerical real time values with the option of a real time 10 second graph display. Peak Hold values and Display Hold functions only require the touch of a button. The Map Trace Mode allows Ghost Map Tracing of the Fuel Correction and Ignition Timing maps. This allows the user to visually see what point of the map is being used in real time. The Ghost Map Trace function leaves markers on the used portions of the map for easy reference. Setting Mode allows full access to the 20×20 ignition timing and fuel correction maps. The user can adjust any portion of this map in 5×5 sections. Air flow correction values can be entered for vehicles upgrading air flow meters. Injector pulse correction menu is used when upgrading injectors. The Acceleration Enrichment Correction function improves response under hard and sudden acceleration. The Cranking Fuel Injection menu corrects the amount of fuel delivered when the engine is being cranked, or when the water temperature is cold. A separate Water Temp menu allows fuel correction according to water temperature. The RPM menu allows rev limiter settings and idle RPM levels. Access menus also vary according to specific applications. Rotary engine Power FC’s accommodate leading and trailing ignition maps. Honda engines Power FC’s allow for VTEC control. Complete boost control is possible by using the optional Boost Control Kit. Changing data is easy: just access the desired point on the map or data, and push the FC COMMANDER keys in the appropriate direction. The ETC Menu contains utility parameters such as: version information, LCD screen brightness, and initialization of all data. In addition, the ETC Mode allows the user to monitor all factory sensors through one screen. This screen can tell the user if any sensor is in use or malfunctioning. The Power FC also comes preprogrammed with several base maps. (Currently with Japan Domestic Market Vehicle Maps, minor initial tuning may be required. Please contact your authorized Power Excel shop for more information.) This makes the initial tuning process much quicker. As with all other fuel controllers, the POWER FC should be tuned on a dynomometer by a trained professional. A high grade air/ fuel ratio monitor is also recommended during tuning to ensure best results. The FC COMMANDER is a hand held controller designed to allow access to the vital parameters within the Power FC. The unit allows a wide range of data modification through its large back lit LCD display. The unit has been designed so that one finger can control a wide array of data. Once connected, the A’PEXi logo will appear in the screen taking the user to the Main Menu. From here, the user can access the three Main Menus (Monitor, Setting, Etc.) The FC COMMANDER “communicates” with the Power FC control unit thereby creating one of the first interactive user friendly fuel management systems. The Boost Control Kit is an optional kit designed to control boost through the Power FC. Simple connection to the Power FC allows the user to access a full self-learning boost controller. The Power FC allows up to 4 different boost presets for any stage of driving. The high grade solenoid valve is the same one used in our Super AVC-R boost controller. As with the S-AVCR, the Boost control kit allows increased boost response and boost stability at high RPM’s.